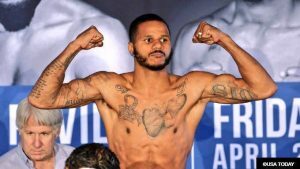 Anthony Dirrell (33-1-1, 24 KOs) is once again a world champion as he defeated Avni Yildirim (21-1, 12 KOs) in what turned out to be a great fight. Dirrell managed to snag the vacant WBC Super Middleweight world title in the process as well. The contest started off with Dirrell boxing effectively and making the shorter and more aggressive Yildirim miss his wild shots. As the contest began to settle in Yildirim began to catch a rhythm as his aggression started to give his opponent trouble. Although the contest was highly entertaining there were several clash of heads which lead to a massive cut for Dirrell. The cut got progressively worse as Yildirim began to target the area. Not only did he manage to open the wound with a few shots upstairs but it was also another clash of heads that really did the most damage. Dirrell was warned by the ringside doctor that the bout would be stopped if the cut continued to open up. Hearing the doctors warnings Dirrell came out in round 10 with an entirely different game plan. Instead of sitting in front of his man and fighting in a phone booth he began to stay on his toes and box on the outside. Although Yildirim did not land a significant punch to open the cut even more the ringside doctor was called in to check on the open wound. It was then declared that Dirrell could not continue because of the severity of the cut. It was determined that the cut was opened due to a clash of heads which lead both men to await the scorecards. The judges had a difficult task in deciding whether they would award Dirrell for his masterful boxing throughout or would they sway towards the aggression of Yildirim. One judge score the contest 98-92 for Yildirim while the two remaining judges scored it 96-94 for Dirrell who regained his WBC Super Middleweight title. Although Dirrell has made it clear that 2019 will be his last year in the sport of boxing he expressed interest after the fight in taking on the biggest challenges including unifying with the other current champions in the division. The co main event on this card was equally as thrilling as Jamal James (25-1, 12 KOs) sent his hometown Minnesota crowd into a frenzy tonight as he dropped and ultimately stopped Janer Gonzalez (19-2-1, 15 KOs) in the seventh round. For Gonzalez it was his first time back in the ring since a November 2017 loss to Radzhab Butaev. James fought a cautious fight as things started off as both men started off tentatively. Things began to heat up as the contest continued. It was becoming increasingly clear that James was just too much for his man as each round he would land the bigger and cleaner shots. As round six was coming to a close James landed a right upper cut that floored Gonzalez. He managed to get to his feet but failed to answer the bell for the beginning of the seventh round as he told his corner that he did not want to continue. It was an entertaining contest but in the end James ended the night with an emphatic statement as he was the first man to stop Gonzalez.